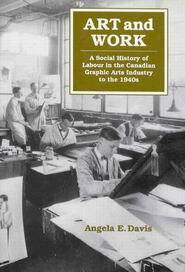 Angela Davis, Art and Work: A Social History of Labour in the Canadian Graphic Arts Industry to the 1940s, Montreal: McGill University Press, 1995. Davis begins her book by explaining that Canadian art and certain elements of Canadian popular culture were not simply the descendants of the European fine art tradition as it was transported to Canada. Rather, it was also strongly affected by Canada's graphic arts industries of the late eighteenth, the nineteenth, and the first half of the twentieth centuries. This graphic arts industry, while involving elements of the European fine arts tradition, was driven, not by a need of the artists to express themselves for emotional, religious, or patriotic reasons, but by an economic demand for visual imagery to enhance products of an increasingly mechanized and commodified society. While hiring artists to create the necessary imagery, those artists worked within an industrialized environment, much like that of other workers, in which their work was mechanically reproduced. As Davis explains, her book traces the origins of this commercial illustration and graphic arts industry from Britain to Canada, showing the role which illustrators, engravers, photo-engravers, and lithographers came to play in the printing and advertising industries. However, she also shows how their role eventually led to a change in their status and how the commercial illustrators and graphic artists came to alter their own understanding of their trade. Davis begins her introduction by defining the subject of her study, commercial art, which is also referred to as illustration or graphic art, as arts which are "reproduced, printed, published, and circulated to a mass audience." (page 3) However, she is clear to explain that she is not simply interested in commercial artists and the creation of such art, but that she also wishes to examine the history of its reproduction, the commercial and technical aspects of that reproduction, as well as the businesses involved in the commercial art industry. While the first printed visual images date back to 1471 when the Augsburg printer, Gunther Zainer produced the first illustrated book, Davis claims that in what became Canada, the reproduction of images began in the eighteenth century when several artists who were visiting the Americas created steel and copperplate etchings which were reproduced by early North American printers. This was the beginning of what Davis understands as two distinct periods of Canadian reproduced illustration. The first period, which lasted until the 1860s, saw artists, etchers, and engravers create printable illustrations which were used for travel books and landscape albums, as well as by a few specialized printers who produced maps, charts, and landscape prints for private individuals and governments. The second period began in the 1870s when changes in the printing industry allowed for the faster and more flexible reproduction of images, and when a number of Canada's illustrators, engravers, and lithographers, as well as printers, photographers, and photoengravers, established workshops and commercial art studios, or houses, in several of the country's major centres. Unlike today, when graphic designers, photographers, printers, and computer technicians are all considered to be part of the graphic design industry, and are even part of the same union (the Graphic Communications International Union), this situation has only existed since the late 1960s. Indeed, before their amalgamation those dealing with the creation and design of text and those working with illustration were understood as working in very distinct fields. Furthermore, during much of the second period of the history of Canadian graphic art, printers, lithographers, and engravers worked separately, and there were specialized unions for photo-engravers, lithographers, bookbinders, printers, and stereotypers. Furthermore, there did not exist training programs for the commercial or graphic arts in Canada up until the 1940s, and even later in some places, such as Quebec. Davis does not pass judgment upon or compare different styles of illustration, but is principally concerned with the changing perceptions of the task, craft, or art of graphic design. As she notes, when illustrations were first introduced into popular magazines in Britain in the 1830s the engravers of those images believed themselves to be artists or highly skilled craftsmen. Indeed, they were often referred to as "art workmen." However, as the printing industry grew and output had to be produced more quickly, and was reproduced by faster presses of the industrial revolution for the growing clientele, the printing industry needed large numbers of such engravers. Thus, regardless of the quality of their work, a division was created between "commercial" artists, who worked as labourers or employees, and "fine" artists. With this division between the "fine" and "commercial" arts, and the related division between "high" and "popular" culture, artists who worked as illustrators, engravers, and lithographers for the printers of popular publications were viewed as being inferior to fine artists. The commercial artist's work, in being commissioned, was understood to be tainted or compromised. Indeed, commercial art was often dismissed as even being an art form. Importantly, Davis notes that this division of the arts and culture had definite class foundations, where those who could afford not to rely upon their art to survive were viewed, and viewed themselves as being true artists, where as someone who may have had the same level of talent, but not as much money, was almost stripped of the right to understand himself/herself, or be viewed by others, as an artist. Given that graphic art refers to the creation and reproduction of visual images from one medium to another, the field has evolved with the technologies that developed to allow different kinds of images to be produced and reproduced with different levels of ease. In the eighteenth century images were transferred to paper principally by means of steel plate and copperplate engraving, as well as etching. With the discovery/creation of lithography at the beginning of the nineteenth century, that process was used extensively for the reproduction of colour images. In addition, the first half of the nineteenth century saw a revival in wood engraving with the introduction of new methods of showing texture and shading. Because of the cheapness of wood, this became the most widely used means of illustrating popular materials. During the second half of the nineteenth century, with the rise of "art posters", first in European cities, and eventually in North America, such posters and advertisements were increasingly printed through lithography. In addition, by the 1880s traditional engraving came under threat by the development of photo-engraving, a chemical process by which a photographic image is transferred onto a piece of copper plate or woodblock which can be used to reproduce the image. However, as Davis explains, this new technology did not see the immediate end of woodblock engraving, but led to many publications being illustrated through a combination of woodblock and photo-engraved images. The commercial art and typographic design companies which did exist in Canada prior to the Second World War were relatively small in size, started by individual or small groups of designers, and often inherited from one generation to another. It was only with the growth of mass communications following the war that several of these firms became managerial-run concerns, opening branch offices in other Canadian cities so as to be able to serve the national market. However, while larger in size and increasingly corporate in character, Davis argues that none of these firms ever became socially or politically influential, although some were eventually purchased by larger, influential media companies. Like larger companies, including railways, lumber concerns, or steamship lines, as these companies became increasingly industrialized, they also became less linked to individual owners or directors. Furthermore, with new developments in technology and larger demands from clients, these companies had to ensure they were using the latest technology and employing, not just their family members, but external workers who could help them fulfill their growing orders. Yet, those employees were also increasingly being asked to specialize and use technology which increasingly mechanized their craft. This furthered the division between artists or craftsmen and "commercial" artists. These developments led in 1904 to the creation of the International Photo-Engravers Union, which defended the jobs and skills of its members and led to conflict with management which was typically in favour of increased mechanization that could see more products being produced by fewer people. In looking at the role of art in society, Davis notes that during the industrial revolution a change occurred in art's status. Initially understood as having qualities which were understood by and intended to influence society as a whole, it eventually altered to be something which was created for its own sake. Thus, there was a separation of art from common life, which was challenged by the efforts of John Ruskin in the 1840s and William Morris in the 1870s and 1880s, who called for a reintegration of fine art and society as a whole. However, since the creation of commercial art and the development of popular culture have often been understood not to be part of the art world, art historians have tended to neglect the history of commercial artists, their work, and their profession. Furthermore, they have ignored the ways in which art has played a role in people's everyday lives. Reproducing a quotation by Alan Gowans, Davis notes that in determining what counts as art, it might be better not to try and define something as being art on the basis of its aesthetic qualities, but what it does. Thus, Davis does not propose to examine the culture of "high art," but commercial art and the role it played in a popular culture which consumed printed works, such as posters, advertisements, logos, etc. Being appreciated by large audiences, Davis claims that, while partly responsible for the division between "high" art and popular culture, the development of the graphic arts industry also created an opportunity to foster an integration of art and common society. It offers the opportunity to move away from a trend in art history to focus upon individual artists, make aesthetic judgments about works, and treat works of "art" in isolation from their place in society. Although she acknowledges that there have been studies of the growth of nineteenth century mass communication's influence, its ability to persuade, as well as to perpetuate middle-class hegemony, little work has been done on the industry itself. In a further attempt to break down the barriers between high and popular art, Davis notes that, while often not acknowledged by art historians, many of the great masters of the past were either paid for or commissioned to produce their art. Thus, there is little difference between how they approached and executed their work and how work was done by commercial artists. The only major difference was that the latter's work was reproduced for commercial purposes. Indeed, prior to the Industrial Revolution, artists were often employed by patrons or the church in the same way that a designer or illustrator of the nineteenth century may have been employed by a publisher to design the layout and/or illustrations for a text. Rather, it was only with the distinction of the Industrial Revolution between "gentlemen" and those involved in the trades that there came to be a parallel division between commercial and fine artists. In the case of Canada, Davis argues that to study the creators of Canadian fine art without reference to their careers in or connections to the world of commercial art is to be unhistorical. Recognizing that their fine art careers were influenced by commercial art is the only means of doing a proper social history of Canadian art. Those artists were employed by industry, participated in commercial art production, and helped to create Canadian popular culture. In addition, Davis suggests that recognition of the connections between high and popular Canadian art can play a role in reintegrating art into popular culture. Davis justifies the cut-off date of her study by changes in technology and business practices which occurred following the Second World War. She also explains that throughout her study she uses the terms "popular illustrator" and "commercial artist" to refer to anyone who created images which were reproduced. She also uses the term "illustrator" to refer to anyone who painted or drew works which were intended for reproduction, as well as etchers, engravers, lithographers, and photo-engravers who recreated works so that they could be printed. Davis' study begins by reviewing the reproduction of the first images in print in England through wood engraving, the development of the popular printing trade, as well as the social status of engravers and the other artists who produced images to be engraved. She next looks at how these technologies and trades were transferred to Canada, first with visiting etchers and engravers, as well as the creations and difficulties of those who stayed. Yet, Davis stresses, that the main concern of her study is in the role of illustration as part of the modernization and industrialization of Canadian life. This covers the creation of a Canadian popular press, packaging, advertising, the retail trade, as well as the establishment of graphic art houses. However, she recognizes that her study is somewhat hampered by the limited written accounts left by commercial graphic artists outlining there views, problems, and concerns about their place in society and/or their profession. While late nineteenth century and early twentieth century popular illustration in Canada was heavily influenced by styles and approaches of the American advertising and printing industries, the initial development of the commercial illustration in Canada was the result of English styles and English reproductive techniques. This industry began in the late eighteenth century and early nineteenth century, when many artists, wishing to reproduce their work, made etchings on metal plates. Yet, it was not this medium which became the foundation of the commercial graphic illustration trade, although such copper etchings were used to produce prints and illustrations for special printings of books. Rather, the early English industry of printing images in books, on broadsides, and in other formats was based upon wood engraving. In addition, while initially thought of as an art or a craft, with the creation of a close connection between wood engraving and the industrialization of the printing trade, as well as the division of labour amongst engravers, wood engravers came to be understood as commercial employees, in contrast to independent craftsmen or artists. However, this change did not occur quickly, but in parallel with the connected transformation of the printing industry from a craft or an art to a trade and the related class divisions between those involved in industry and the gentry, whose creations were allegedly not made for commercial gain and out of an intellectual, emotional, or spiritual interest in a subject. The transformation of engraving from an art to a trade occurred as a result of a number of complementary factors. The British government's relaxation on the tax on paper, combined in increase in literacy, which was furthered with the introduction of mandatory education for children (1870), saw a rise in the number of newspapers, books, and magazines being printed and read by an increasingly literate public. Similarly, there was a increase in the amount of advertising which could be economically printed on paper and read by the public. However, with the rise in the volume of printed material, there was also a recognition by printers, publishers, and advertisers that text accompanied by visual material could enhance the communication of the written message. Thus, by the 1950s, illustrated newspapers and magazines had become popular, as had illustrated scientific periodicals, illustrated books, and advertisements which incorporated illustrations. While all of these publications called for engravers to produce images, printing technology had evolved to allow for the reproduction of larger and larger amounts of material in less time. While woodblock illustrations had been printed with text since the fifteenth century, such illustrations, which were either included within the text or offered separately, were typically black and white, of a uniform texture, and if coloured, were usually coloured by hand. However, with improvements in wood block engraving and metal etching technology at the beginning of the nineteenth century, improvements in printing technology, as well as the popularity of English landscape painting, several of Britain's major landscape painters began engraving their own work, or hiring professional engravers to reproduce them. They then issued reproductions of their works either as individual prints or as bound collections. At the time there was no distinction between popular and high art. Rather, leading artists such as Turner, John Constable, John Sell Cotman, and David Cox made use of reproductive illustration so as to further disseminate their works and were not beyond developing and making use of a mixture of what would later be viewed as fine and applied artistic skills. The same was true for lesser artists who needed such a range of skills in order to earn a living from their artistic talents. Indeed, artists who were well known and whose works were not in demand often had to sell their skills in a number of related fields, including drawing, miniature painting, portrait painting, sculpting, engraving, lithography, printing, bookbinding, theatre scene painting, sign painting, and even house painting. As Davis explains, involvement in such occupations meant that artists occupied ambiguous social positions between visual artists whose principle concern was the creation of art which could then be sold, and those artistic skills were employed on demand or focused upon the reproduction of existing works which could be reliably sold. As Davis notes, this division between established artists who made use of reproductive technology and those who were not well known and forced to focus upon the application of their artistic skills to more immediately lucrative pursuits foreshadowed the clear division between the high and applied arts which would develop later in the century. A further example of the beginning of this distinction can be seen in the Royal Academy and its admission of only certain kinds of artists. While created in 1769 with the purpose of furthering the social position of visual artists, Davis notes that the academy viewed painters as being "a special group of imaginative, creative people," while those who were employed as engravers were understood to be mere copiers and not worthy of membership. (page 17) Furthermore, the general public, which was buying the works of engravers and illustrators in books, magazines, and who commissioned such artists to execute work that would enhance their businesses, and which hired those illustrators and engravers to reach painting and illustration, was simultaneously excluding those same artists from the social category of true artists, which Davis claims was understood as including "special people," and certainly not those who painted, illustrated, or engraved for commercial purposes. She argues that this was the beginning of the "myth of the artist" as being someone who did not create principally out of financial need, but as a form of emotional expression. However, since few artists received royal or governmental patronage, or were of independent means and could pursue their art outside of any economic constraints, most artists were compelled to produce what the market demanded. Illustrated newspapers and magazines began to appear in the early 1840s, and the illustration process of choice was the woodcut. Metal engraving, while effective, was difficult to print with metal or wood press type. In addition, although lithography was suitable for printing with text, the process was never popular with the British publishers of mass publications for much of the nineteenth century. Rather, woodblock engraving was used for the first "penny" story magazines and newspapers such as the Penny Weekly Dispatch and Bell's Penny Dispatch. Recognizing the popularity of such illustrated publications, the newsagent Herbert Ingram founded the Illustrated London News in 1841. His approach of having illustrations accompany the publications major stories was reproduced in other major magazines of the second half of the century, including the Penny Magazine, the Mirror, Punch, the Saturday Magazine, and the Graphic. Furthermore, this demand for illustrations led to an increase in the demand for skilled woodblock engravers. The illustrators for these publications were recruited from many different specialties including watercolour painting, typographical draughting, military survey draughting, and painting. However, the engravers were essential to the reproduction of their illustrations. Engraving of the period differed from that of earlier centuries due to a new engraving process developed by Thomas Bewick. The Newcastle apprentice to the engraver Ralph Beilby, in the last quarter of the eighteenth century Bewick developed a form of engraving which allowed for shading and detail which had not been seen before, with earlier engravings largely having been of a single shade. Most earlier engravers carved their images out of wood which was cut with the grain, removing the wood from between drawn lines. Bewick, however, engraved in wood which was cut across the grain, and used tools similar to those of a metal engraver to carve this harder surface. Since he was not carving against a grain, which was the case with woodcuts, Bewick was able to make much more detailed engravings. Those taught by Bewick, and those who followed his approach to engraving, were able to create very detailed and well executed end-grain engravings which, unlike traditional woodblocks, were durable enough to be locked into printing frames and used to produce thousands of copies of the same image. The development of wood engraving, combined with the introduction of both steam powered bed and roller presses at the beginning of the nineteenth century allowed for the production of type and images at much faster rates. This, combined with the reduction in the cost of paper brought about through the mechanization of the paper making process and the introduction of cheaper wood-pulp paper, saw a lowering in the cost and an increase in the availability of printed material. However, as Davis notes, while printing had traditionally been understood to be an art, as the process was mechanized and its products became more abundant and readily available, printers came increasingly to be understood as merely workers in an industry. While the industrialization of printing can partially account for the rise in the growth of the popular press during the nineteenth century, as mentioned above, these were not the only reasons. Davis also notes that, while the British government had introduced a tax on newspapers in 1819 so as to reduce the threat of the publication of seditious material, this tax was reduced in the 1830s and finally abolished in 1855. Also, during the 1840s the cost of paper production dropped by half. Thus, by that decade it was possible to produce all of the books, magazines, and other printed material the public desired and, with the rise in public literacy, there was an increasing demand for such materials. While, at the beginning of the nineteenth century, the British education system was largely geared towards only educating those who could afford to pay, by the 1930s the majority of people in England were literate. This increased as the century progressed, with the introduction of compulsory education for children, as well as the creation of charitable and trade related adult education programs. Illustrated material in the popular press began to be used as early as 1832 when the educational and religious magazines, Penny Magazine and the Saturday Magazine began including illustrations to accompany their content and reinforce their subject matter. In 1841 Punch magazine was launched, and in 1842 the Illustrated London News, both of which included political cartoons, reproductions of the famous, and illustrations which accompanied many of their stories. In the case of newspapers, illustrations were not used regularly until the end of the nineteenth century. As Davis explains, it was only in 1890 that the Daily Graphic began to use wood engravings and also began to make use of the newer processes of photo-engraving and half-tones, and it was only in 1904 that the Daily Mirror began using half-tone blocks which were made from photographs. The industrial environment in which engravers and illustrators found themselves working, while increasingly seen as being apart from true art, did lead to the establishment of the graphic arts industry. It was the demand for illustrations and engravings of those illustrations that eventually led to the establishment of commercial engraving houses and commercial art studios. Those artistic workshops, fed by a constant demand for illustrations and engravings from clients, allowed for the reliable and constant stream of images being produced for and reproduced by periodicals and newspapers. Yet, as Davis notes, while Bewick had argued in his memoirs that the use of engraving would never be limited and that it would become the most available form of art in the world, it was its very ubiquitousness that led to it being demoted from an art form to a trade. Those who were involved in engraving rarely produced images of their own making, and the illustrators from whose work they copied, like the engravers, were rarely recognized for their work. Furthermore, payment for the work of both engravers and illustrators was usually determined by the printers. Indeed, Davis claims that many of the master engravers of the nineteenth century should have, in her opinion, been viewed as both gentlemen and artists given the quality of their work and contributions to the profession. In order to meet demand, within the engraving and illustration fields individuals came to specialize in specific kinds of illustrations and engravings which they could produce more quickly and more reliably than others. Unfortunately, this furthered the notion of the work of engravers and illustrators as being industrial and mechanical in character, and thus, not artists. Some concentrated upon faces, others clothing, some landscapes and others machinery. In addition, by the 1850s a process had developed where blocks, upon which illustrations had been traced, could be broken up, worked upon by specialists of the images found in the various sections, and then bolted back together again. The success of an engraving firm would depend upon such approaches since the firm would be judged upon both the speed of its work and quality of the resulting engravings. Davis notes that one of the major engraver/illustrator critics of the diminished social position of both illustrators and engravers was W.J. Linton. Born in London in 1812 and learning engraving in the tradition of Thomas Bewick, Linton was taught by the engraver George Wilmot Bonner how to prepare his own blocks, draw and sketch, and how to reproduce those images in wood. Opening an engraving firm in 1842 with the fellow engraver John Orrin Smith, Linton and his firm produced engravings for the Illustrated London News, Bell's Life of London, and other publications. In the 1850s his firm was the first to design the harmonious integration of type with illustrations, using the images of Dante Gabriel Rossetti, John Everett Millais, and other artists to illustrate an edition of Tennyson's poems. Davis claims that such works were the first to be produced in the manner of a modern graphic arts business in that it made use of the skills of illustrators, engravers, typographers, and printers. Using the same approach the firm also produced an illustrated edition of Shakespeare and a guide to the Lake District. However, despite his success, Linton was discouraged at the status of engravers and illustrators in England, and thus, immigrated to the United States in 1866, where he lived for the rest of his life. In the United Sates he was finally recognized as an artist and also made significant contributions to the development of American illustration and engraving. Linton's views reflected those of John Ruskin, the early Victorian art critic who was the first such commentator to recognize the distinctions which were being created between "high" and "popular" art. In addition to being the first major critic to recognize the merits of Turner, the Pre-Raphaelites, and the ideas of perception which would later fuel the French Impressionists, Ruskin argued that a division between the fine arts and the useful arts would result in a society where only the elite, to whom exposure to the high arts would be restricted, would be encouraged to contemplate the creativity and innovation of art, and where those producing the useful arts would not feel encouraged to produce innovative works. Referring to Ruskin's essay "The Nature of Gothic," Davis notes that Ruskin held that there should be no distinction between artists on the basis of their being referred to socially as an "artist" or a "workman," where one produced what was considered fine art and the other produced useful art as a specialized worker in a commercial studio. Rather, he claimed that artists should only be distinguished according to their experience and skill. Ruskin's disciple, William Morris, focused upon the idea of good art requiring experience and skill by emphasizing a return to hand-craftsmanship and the craftsman having numerous skills so as to allow him/her to fully create a work of art. For Morris the true artists did not simply produce a particular element of a work, or rearrange pre-fabricated products, but was able to truly produce the item, or as much as is possible, from start to finish, thus having full control over the entire creation process. Furthermore, given that only skill and experience distinguished the good from the bad artist, Morris also rejected the idea of there being a hierarchy of arts. Like his contemporary, Arthur Mackmurdo, Morris agreed with Ruskin that allowing the idea of "art for art's sake" to be the guiding principle of the arts would lead to a decline in creativity and innovation, and would result in alienating most people from the arts. Regardless of the views of critics such as Ruskin and Morris, by the last quarter of the nineteenth century engravers and illustrators were largely known as artist-craftsmen and were typically regarded as skilled commercial tradesmen. In the 1880s, with the widespread introduction of photoengraving, wood engravers either had to become knowledgeable in the new photoengraving process, or remain dedicated to a dying field of manual wood engraving. As for the illustrators/designers of wood engravings, they were largely excluded from the new process, replaced by the photographer. Some, however, became advocates of the arts and crafts movement, through which their skills were still appreciated, or turned their attention to printing and print design. They would eventually become the "commercial artists" of the twentieth century. Such commercial art studios, graphic art firms, and agencies dealing with reproductive technology attracted both engravers and illustrators, and, as Davis notes, by the beginning of the twentieth century, association with such an institution often led to the presumption that an illustrator or engraver was an inferior artist, and probably of the lower-middle, or lower class. While possibly believing in Ruskin's notions concerning the inappropriateness of ranks of artists, many illustrators and engravers took jobs in such establishments in order to make ends meet. Indeed, so many were employed in this way that by the late nineteenth century the publishing industry was the chief employer of artists in England. Given the low social status of artist-craftsmen in England in the second half of the nineteenth century, caused by their involvement in the industrial production of images, Davis suggests that it is not surprising that many immigrated to countries where they hoped their artwork would not only be in demand, but would also garner them more respect and a high social position than that of a skilled industrial worker. In the case of Canada, few illustrators immigrated before the establishment of an industrial base which could support an illustrated popular press. Rather, at first most were simply visitors accompanying exploring and surveying parties. They were often armatures from amongst the military officers on exploration parties, but were occasionally professional artists who had accompanied organized visits or incursions into what would eventually become Canada with the specific purpose of making a visual record of what they saw. Their often Picturesque work was typically printed in England and continental Europe as single sheet prints or in books and folios. Such prints helped to further the English fondness of travel books and for illustrations which were made in the Picturesque style. Furthermore, as Davis notes, their illustrations were often printed in the intaglio approach to engraving on copper or steel plates. An example of the influence and longevity of both this kind of print and the style is offered by Davis' discussion of William Henry Bartlett. Indeed, the often bucolic "views" and "scenes" illustrated by Bartlett for Canadian Scenery Illustrated, printed by the London publisher George Virtue in 1840, were similar in style and content to the later works of the Canadian Illustrated News and Picturesque Canada in the 1870s and 1880s. His work also reflected that of J.M.W. Turner since Bartlett used Turner's approach of making sepia drawings, which were allegedly the easiest for engravers to follow. In addition, three of the engravers who worked on Bartlett's engravings had been trained by Turner. Davis claims that these factors must have played a role in reinforcing the interest of Canadian artists in landscape-focused visual art. Bartlett, however did not live permanently in Canada. Rather only visiting between 1838 and 1841, he worked as an artist-illustrator in England. Never attaining membership in the Royal Academy, unlike Turner, he was skilled enough in his interpretation of foreign places for the English domestic market that he was able to specialize, and was not required to perform a range of artistic jobs. Those early illustrators, engravers, and lithographers who did permanently immigrate to British North America typically worked for colonial or imperial governments or for the military. After the late eighteenth century they occasionally created single sheet prints in collaboration with local printers. However, in colonies with limited demand for their specific skills, they had to have or develop other locally practical skills such as map making, calling-card making, or jewelry engraving. Others, however, were not successful since they found that the British North American colonies were not yet ready for their skills. They required an environment with a paper manufacturing industry, an increasingly mechanized and industrialized printing industry, the development of urban centres and concentrated advertising markets, and a largely literate public in order for a popular press to develop which would make use of their illustration and engraving skills. Printing presses did not arrive in Canada until the mid-eighteenth century, and even then, they were largely unsuitable for the printing of detailed visual images. The first press in Canada was that brought to Halifax in 1751 by the Boston printer Bartholomew Green. Used by John Bushell after 1752 to publish the Halifax Gazette, its prints were not traditional newspapers, but rather broadsides which offered proclamations and public announcements. Similar early publications were produced by the presses established in Quebec City beginning in 1764, in Montreal in the 1770s, in New Brunswick and Prince Edward Island in the 1780s, and in Upper Canada in the 1790s. However, as Davis notes, when the work of engravers and lithographers did begin to be published in British North America they followed the same general geographic pattern as the establishment of printing, beginning in Nova Scotia and Lower Canada in the 1790s and reaching Upper Canada by the beginning of the nineteenth century. The process of urbanization which was required for the establishment of printing presses, the textual and illustrated products of which would be consumed by concentrated and growing populations, began following the end of hostilities between Britain and France in 1760. With military stability and a gradual increase in the number of immigrants arriving from Britain and the United States, the commercial and military character of the colonies began to change. No longer an imperial outpost, the main importance of which was supplying Britain with fish and furs, Canada's economy began to diversify and develop domestically. As communities grew large enough to support either a government-owned press or an independent printer, local newspapers and gazettes began to be produced. With the arrival of these presses and regular publications, colonial engravers and lithographers were able to not only have their work reproduced domestically, but eventually received work from local publishers and newspapers to produce illustrations and engravings. Thus, once John Bushell established his press in Halifax, or Samuel Neilson set up his in Quebec City, there was a means for local illustrators, engravers, and lithographers to have their work reproduced. Indeed, the first illustration published in Canada was done on Bushell's press. It was a view of Halifax Harbour by Anthony Henry published in the Nova Scotia Calendar in 1776. Thus, it was not only the first published illustration in Canada, but had been incorporated into a published book. Henry had taken over Bushell's print shop upon the latter’s death in 1761. Like Bushell he ran it as the King's Printer, a dubious distinction given the poor pay such printers received from the colonial government for producing gazettes and political broadsides. However, beginning with Bushell's press, King's printers developed across British North America, as did a number of independent printers. In Quebec City printing began with the establishment of a press by two American printers, William Brown and Thomas Gilmore. Becoming the King's Printer and also printing religious and secular works, the firm was inherited by Brown's nephews Samuel and John Neilson in 1793. Producing the Quebec Gazette, Quebec Magazine, the firm also produced almanacs, directories, as well as French, English, and Latin religious works. John Neilson was eventually elected to the Assembly of Lower Canada, transferring control over the publication of the Quebec Gazette to his sons. Situated at the centre of commercial and economic power in British North America at the time, the Neilson workshop became the centre of printing in the Canadas for approximately half a century and, according to Davis, its apprentices were largely responsible for spreading printing and illustration throughout Upper and Lower Canada. The first illustration known to have been drawn in Canada (the physical origins of the Bushell image are not clear) was made and engraved by an engraver employed by Samuel Neilson, John George Hochstetter. This view of Quebec City was the first illustration in Canada which was produced in the style of English and European printers, as single-sheet prints, included as a bonus with the Quebec Magazine in 1792. Hochstetter, like those which would be influenced by Bartlett in the next century, produced works in the Picturesque style which was popular among English engravers and artists. Regardless of these early eighteenth century engraved and printed illustrations, few printers made significant use of illustrators and engravers until the 1830s and 1840s, by which time the concept of an illustrated press was becoming popular in Britain and began to be tried in British North America. For example, the engraver Charles Torbett, who according to Davis was a productive and respected Halifax engraver who practiced in the city from 1822 to 1834, was unable to survive upon his illustrating/engraving commissions. Rather, he was also known as an engraver of maps, bookplates, treasury notes, and book illustrations, as well as being a silversmith. Despite his success as an engraver, Davis posits that he likely moved to Boston in 1834 where he found a larger market for his work. In addition to the British North American market being relatively small, Davis argues that many of the early presses used in the colonies were not suitable for printing finely engraved images. She also argues that engravers who were not also talented illustrators suffered from a lack of images to reproduce for what market may have existed for printed illustrations. Another example of an engraver who was forced to leave British North America in the first half of the nineteenth century was James Smillie. Born in Scotland, Smillie had immigrated to Quebec City in 1822. The son of a jeweler, Smillie apprenticed as a jewelry and picture engraver. In his father’s jewelers, and then in business with his brother as a jeweler and engraver, most of Smillie's engraving work was for military officers, although some did have them engrave their watercolours. Producing several engravings of single-sheet illustrations, book illustrations, and maps while in Quebec, and often for little money, his greatest success was his commission to engrave the illustrations for Picture of Quebec, the city's first illustrated guidebook. Also not lucrative, Smillie was only able to see the work completed because it was printed in New York. According to Smillie, there were no presses in Quebec which were capable of adequately reproducing the images. Recognizing the greater opportunities for an engraver in New York while visiting the city for the publishing of Picture of Quebec, Smillie moved there in 1830, quickly establishing himself and eventually becoming a respected American engraver and father of the American landscape engraver James David Smillie. While Smillie had been frustrated in the 1820s by the lack of both a market for illustrated prints and printing presses suitable for printing illustrations, by 1850 suitable presses did exist in Quebec and the demand by the public and printers for illustrated material was growing. In the case of lithographic printing, presses existed in British North America by the 1820s. This process, which allowed the illustrator to draw with water-resistant material (such as wax) directly on a smooth stone surface, removed the need for engraving. The image could also be drawn on specially treated paper which, when applied to the stone, could transfer the reverse of the image in water resistant material to the stone. This removed the need for the illustrator to draw the desired image in reverse directly on the stone. Government lithographic presses were found in both Quebec and New Brunswick in the 1820s and were being used to reproduce sketches for government reports. In Upper Canada a private lithographer, who was also a jeweler, Samuel Oliver Tazewell, established himself in Kingston in 1829. Moving to York in 1832 in anticipation of being appointed lithographic printer for the colonial government, a job which would have involved quickly and cheaply producing maps for immigrant settlers, Tazewell was never given the contract. Instead, as a result of political disputes over printing appointments, a printer who was ignorant of lithography was appointed to produce government material. Although he did produce some lithographic work for the Canadian Literary Magazine in 1833, for Richard Henry Bonnycastle's 1836 American Journal o f Science and Arts articles on North American geology, and a number of views of Canadian landscapes which he produced between 1832 and 1834, Tazewell eventually moved his family to St. Catharines in 1835 and reestablished himself as a jeweler and watchmaker. Regardless of the failures of Smillie and Tazewell to become successful engravers and lithographers, Davis notes that by the 1850s an environment had developed in several Canadian centres which could sustain an illustrated popular press. Beginning on a large-scale in Montreal and Toronto, urbanization and industrialization gradually spread to most populated parts of the country. The factors which led to the development and acceptance of a popular press included a rising population; a related increased need for supplies and services; the spread of accessible and mandatory education for children; a related rise in literacy; the domestic mechanical manufacturing of cheaper wood pulp paper rather than paper from rags; the installation of steam driven high volume cylinder printing presses; transportation and communications systems, of which Montreal and Toronto were regional hubs, that could organize and transport popular printed material; and the growth of businesses which had begun to recognize the value of using advertising, including illustrated advertising, in the media to increase sales. While, in the case of literacy, compulsory education, which was introduced in the eastern colonies of British North America in the late 1840s, did help to increase the number of people who could read, there were other factors involved in this increase. By the 1860s all of the major Canadian centres had libraries, reading rooms, mechanics institutes, and literary societies. Just as Britain had experienced a rise in literacy in the 1840s, followed by a rise in the demand for popular publications, the increased reading in Canada was responded to and encouraged with newspapers and magazines that could be transported further afield on the colonies' growing rail transportation networks or through the mail as postal rates fell. George Brown, owner of the Toronto Globe, had already imported steam-powered cylinder presses which could produce many more papers than his older presses. Now in the 1860s, much like the British press in the 1840s, Brown, and publishers such as George-Édouard Desbarats in Quebec began to incorporate engraved and lithographic illustrations into their publications. This illustration work also provided employment for the itinerant skilled engravers and lithographers already in Canada. While Smillie and Tazewell had failed to successfully establish themselves as printers of illustrations, Davis notes that there were several publishers who, already successful in the publishing trade, were able incorporate illustrations into the material they had printed. These included Napoléon Aubin, publisher of the political newspaper La Fantasque. Aubin claimed to have established the first lithographic press in Quebec City in 1840. With this press he published a successful series of prints of views of Quebec City. Similarly, in the 1830s a set of views of the City of Montreal were printed by Adolphus Bourne. Due to their success, the prints were produced again in the 1840s. Such publishers did employ printers artists, engravers, and lithographers to produce their illustrated prints, but not on a full-time basis in those early years. Rather, as noted above, the illustrators, engravers, and lithographers needed to have some additional means of income in order to survive. It was not that there were not printers who could have printed benefitted from including illustrations in their products by the 1840s. Indeed, by that decade there were music publishers, stationery manufacturers, book publishers, and other kinds of publishers in each of British North America's major centres. As Davis argues, all of these publishers would have benefitted from the addition of illustrations. However, there was a reluctance amongst publishers both to trust the illustrative work of colonial printers, engravers, and lithographers, as well as to accept the benefits which would arise from adding illustrations, which would mean an additional cost, to their publications. However, as Davis notes there were some examples of publishers in the 1840s and 1850s who did take the risk of incorporating illustrations into their publications. These included the partnership between the British immigrant printer and publisher Hugh Scobie and the printer John Balfour from 1846 to 1853, as well as the British immigrant William Walter Copp who, after apprenticing with Scobie, established Copp, Clark and Company in 1869 with Henry James Clark. Both of these firms advertised themselves at various times and in various situations as booksellers, stationers, printers, lithographers, engravers, bookbinders, publishers, and map printers. Reproducing images was not necessarily their primary focus, it was amongst the services they provided and one for which they regularly required the skills of engravers, printers, illustrators, and lithographers. While not based in the popular press, the foundations of the Canadian commercial graphic arts industry was laid by a number of printers who, starting in the 1840s, were able to establish themselves as either general printers who could also print illustrations, or as illustrative printers, whose work could range from fine pictorial engraving for advertising, to stationery, maps, visiting cards, and even heraldic crests and seals. One such firm was Ellis and Company of Toronto, established by the English engraver John Ellis in 1846 after having worked as a steel engraver in Toronto from 1842. A highly skilled engraver, Ellis and his firm printed portraits, landscape views, and even the first Canadian printed bank notes. However, the firm's greatest profits came from its maps and engravings for heraldic and other commercial purposes. While having to diversify in order to succeed, Davis claims that Ellis' firm was successful, being sold to the English engraver, Joseph Rolph in 1867. Rolph had come to work for Ellis in 1857 and renamed the business J.T. Rolph Engravers after the purchase. In 1870 it changed to Rolph, Smith and Company when he partnered with his brother and another engraver, David Smith. This firm became one of the major illustrative reproduction companies in Canada during the end of the nineteenth and beginning of the twentieth century, although its name would change again to Rolph and Clark, and then finally in 1917 to Rolph, Clark, Stone, Ltd.
Davis begins by explaining that with the urbanization and industrialization of Canada between 1870 and 1914 great changes occurred for Canada's artist-craftsmen. With the introduction of new technologies, mechanization of older hand-crafts, and new kinds of business, some artisan-craftsmen, were able to profit from these new developments, expanding their workshops to become larger businesses which produced large numbers of products. In many cases, the owners of these businesses, while originally artisans, gradually became more businessmen, yet, retaining their craftsmen skills so as to train, and manage his employees, making decisions as to the direction of the business which were fundamentally based upon a detailed understanding of the craft. In the case the artist-craftsmen who were employed by such firms, those who made up the vast majority of artist-craftsmen, they gradually lost the need for their original artistic skills. While the first nineteenth century graphic arts firms employed wood engravers, these were eventually joined by photo-engravers. Each kind of employee was typically limited to only practicing those skills for which he/she was hired and not a diverse range of related jobs. Although some of the wood engravers did learn the new engraving skill, some did not, just as some of those only trained in photo-engraving knew very little about wood engraving. This led to divisions in the field of graphic art reproduction, a process which gradually limited the artisans to very specific positions in particular kinds of companies, and limiting their ability to make use of diverse, yet related, skills. Furthermore, Davis notes that those who were only trained in the new process did not refer to themselves as artists, craftsmen, or even "art-workmen," but simply as workers, leading to a class division between the "artisans" or "craftsmen" and those who were employed in the more mechanized processes of graphic reproduction. Furthermore, illustrators, or "artists," were increasingly separated from the specialized artisan-craftsmen engravers, as well as the photoengravers, and all of three of these different groups of commercial artists were separated from management, forming distinct unions through which to protect their seemingly distinct interests. One of the successful publishing firms which hired engravers, lithographers, printers, and illustrators was the Montreal concern of George-Edouard Desbarats. Inheriting his father's Ottawa printing business in 1865, which was the printer to the Lower Canadian government, Desbarats expanded the printing and publishing firm, only to have it destroyed by fire in 1869. Relocating to Montreal, he proceeded to reestablish the business, finally printing a collection of the writings of Samuel de Champlain, which consisted of type and lithographic plates, that was being completed at the time of the fire. He also launched an ambitious and ground-breaking serial publication, the Canadian Illustrated News. Before the launch of this magazine, the only other publications to make extensive use of illustrations in Canada had been farming magazines and a hand-full of short-lived journals. In the 1840s and 1850s the Canadian Agriculturist, the British American Cultivator, and the Canadian Farmer had all used the engravings of the British engraver Frederick Lowe, who had been trained by followers of Bewick. In the 1850s and early 1860s the engraver John Allanson produced engravings of the Toronto Industrial Exhibition for the Canadian Journal. In addition, the engravers G.A. Binkert and Edward Roper rendered illustrations for a journal from Hamilton, Lower Canada, which was also named Canadian Illustrated News, but which was not a success. Desbarats' new magazine, which was illustrated with the works of William Leggo, contained not only woodblock engravings produced from the illustrations of skilled artists, but it was the first journal in the world to make use of the new technique of photoengraving. Photoengraving replaced the need to engrave images by hand, but allowed them to be transferred to a block through a chemical process. Photoengraving had been developed during the 1850s, and Leggo had been trained in the new technology in Munich before establishing Leggo and Company in Quebec City. Creating his own version of the process, he patented it in 1865 as the Leggotype. In 1869 he moved to Montreal and joined with Desbarats to produce the images for the Canadian Illustrated News, including an image of Prince Arthur for the cover of the first edition. He also provided the images for the New York Daily Illustrated, which Davis explains was allegedly the first illustrated daily newspaper in the world. However, the process of photoengraving was expensive and time consuming and Desbarats eventually found that it was not practical for the Canadian Illustrated News, which, having become popular, required a regular and prompt supply of illustrations. Thus, after its first several years of publication, the Canadian Illustrated News came to rely upon wood engraving for its illustrations. With Desbarats declaring bankruptcy in 1872, the magazine continued to be published by a stock company until 1883. It was followed in 1885 by another publication launched by Desbarats, the Dominion Illustrated News, which was also an illustrated publication printed on glossy paper rather than newsprint. Surviving for ten years, this second publication was evidence of the popularity of such illustrated newspapers and magazines once they were introduced to the Canadian market. Yet, they were so popular that photoengraved images could not be produced fast enough to meet the demand. Thus, even at the end of the nineteenth century wood engraving and lithography remained the most common means of producing such images. These older techniques would, however, eventually be replaced by photoengraving once faster and cheaper processes were perfected. As Davis notes, Desbarat's publishing firm, revived in the 1880s and employing illustrators, engravers, lithographers, and printers, survived up until the 1970s. It is thus an example of the new kind of printing and engraving firms which developed in the second half of the nineteenth century and through which many graphic artists were employed. Davis claims that initially, in the 1860s and 1870s there was little social distinction between engraving and printing firms and those whom they employed. Using the example of Toronto engraving and printing houses to illustrate her point, she notes that during the 1860s and 1870s the city was home to a number of such firms, including Copp, Clark and Company; Rolph, Smith and Company; the Toronto Lithographing Company; Bengough Brothers; and Beale Brothers. All of those companies were based within the relatively small city, which was only approximately ten square kilometers in size. They were located along side banks, law offices, the provincial legislature, factories, and warehouses. Furthermore, the houses of the wealthy were not geographically separated from business areas of the city of from the accommodations of the less wealthy. Rather, employees and employers, high and lower classes lived in close proximity to one another. Intermixed with the other business of the city, many of Toronto's engraving and printing firms continued their practice of advertising themselves as the providers of various services, including printers of different kinds of materials, book binders, publishers, and embossers. Yet, from the 1870s on, these firms began to become increasingly specialized. Some came to offer only specific kinds of illustration reproduction services, such as the Toronto Engraving Company (originally Beale Brothers), while others came to focus more on specific areas of business, such as the design and production of stationary or illustrations and advertisements for publications for newspapers and magazines. The growing use of illustrations and illustrated advertisements in newspapers and magazines in the 1870s and 1880s corresponded with other forms of commercialization of illustration, including extensively illustrated catalogues, such as the Eaton's catalogue, first published in 1884. Furthermore, Canada's first advertising agency, opened by Angus McKim, opened in 1889, offering advice and services to help companies attract customers, furthering a departure from traditional Canadian newspaper and magazine advertisements that largely avoided the use of illustrations, as well as extravagant claims, immodesty, or excessive self-praise. With this specialization and growth, the original owners of printing and engraving firms evolved from being senior artisan-craftsmen, who worked with others whom they employed to assist them with their work, into business owners, who employed skilled, but largely anonymous and replaceable employees. This growing divide between the owners/managers and the employees was occurring as the city itself was expanding, and as clear distinctions between the social realms of the elite and mere wage earning employees became much more evident. The growing demand for illustration reproduction, and the resulting reorganization and increased division of labour occurring at companies including Bengough Brothers (which changed its name to Grip Printing and Publishing Company in 1882), Rolph, Smith and Company, the Toronto Engraving Company, and the Toronto Lithographing Company, saw these printing and engraving firms expanding even during and soon after the Long Depression starting in the 1870s. Continuing to expand in size, the number of Toronto's engraving and printing firms also began to grow during the 1880s and 1890s so as to meet the increasing demand for illustrative work. Davis notes that in 1884 there were sixteen engraving firms listed in the Toronto Directory, a number which had grown to thirty-one by 1889. Furthermore, the firms began to specialize in specific kinds of engraving and image reproduction, with some offering the new process of photoengraving, while others identified themselves as dealing in lithography, brass, general, half-tone, metal, or wood engraving. This period also saw the introduction of other new technologies. In the case of typesetting much of the laborious work was removed with the introduction of linotype and monotype machines. Printing presses were also improved with the introduction of curved stereotype plates for rotary presses, allowing for the printing on both sides of paper at once. Photoengraving, while invented in the 1850s and further developed by Leggo in the 1870s, was not accepted as a reliable technology until the late 1880s and 1890s. Photoengraving would eventually replace wood engraving, although graphic arts firms in both the United States and Canada did not immediately abandon the older technology, but used a mixture of engraving processes for many years. These included traditional wood engraving where designs were drawn onto woodblocks, a process where photographs were printed onto woodblocks which were then engraved, as well as the new photoengraving process which allowed for the reproduction of images on light sensitized zinc and copper plates. In the case of line cut drawings (or those which did not have changes in colour) a photograph negative of the image would be placed upon a zinc plate, exposed to light, and then the exposed parts of the plate would be etched away by an acid bath, leaving an accurate copy of the photograph on the plate which could be inked and printed. In the case of something other than a linecut illustration, the photograph would be prepared as a half-tone photograph negative -- a negative consisting of small dots made by taking the photograph through a screen or grid. Exposed to light upon a light sensitive copper plate, the resulting etching would accurately reproduce the shading and shapes of the photograph. The introduction of specialization and new technology within the graphic arts also led to changes in labour organization. In Toronto, the Toronto Typographical Society had been formed in 1834, concentrating the collective efforts of its members upon maintaining consistent wages and stopping employers from hiring young apprentices who would accept lower wages. In 1866 it united with the International Typographical Union, as would other Canadian printers. However, these early printers wee skilled in all of the elements of the printing trade of their time. As Davis notes, with the introduction of different kinds of presses and typesetting technologies, "printers" began to divide into different kinds of workers, with the first division being between typesetters and pressmen. And while the International Typographical Union did include such diverse groups as pressmen, stereotypers, electrotypers, bookbinders, and photo-engravers by the 1880s and 1890s, it had allowed them to form separate craft associations, which eventually evolved into autonomous unions. Between 1889 and 1922 pressmen, bookbinders, stereotypers and electrotypers, and the photo-engravers all came to form separate unions. (p 76-7) Thus, by the early twentieth century the owner of Toronto Engraving Company, Brigden, no longer ran a company which was staffed by a family of artworkmen, as had the workshop of W.J. Linton where he had trained. However, the unionization of the various groups involved in the graphic arts trades can also be seen as a counterforce, or a reaction, to their being deskilled and/or socially and economically impoverished. Maintaining certain wages and working conditions, allowed them to retain a certain level of social and economic status, upon which they could build with greater union strength, as Davis notes occurred in 1904 when the Toronto Engraving Company accepted the demands of the Photo-engraver's Union, being the first to do so in Canada. Davis concludes the chapter by noting that, by the beginning of the twentieth century, Toronto had emerged as the major graphic arts centre of Canada. In the 1860s, with the emergence of publications such as the Canadian Illustrated News, Montreal had been the major Canadian centre for printing, graphic artists, and illustration reproduction. However, despite the advances made by William Leggo, the city's graphic arts industry was slow to adopt new technology, with most firms, including that of Desbarats, continuing to use the older processes of lithography and wood engravings for several more decades. In contrast, Toronto firms were quick to embrace larger and faster presses, as well as both half-tone photoengraving and electrotypography. These Toronto firms began to change and expand rapidly in the 1880s and 1890, benefitting from new opportunities in printing and advertising which made use of these new technologies. Davis begins the chapter by pointing out that it is inaccurate to claim that the pre-First World War period did not see the development of any art that can be defined as "Canadian," as she claims is often claimed by art historians. She argues that the idea that a truly Canadian style only emerged with the Group of Seven in the 1920s, is based upon a view that ignores the realm of commercial art. It was during the 1870 to 1914 period of industrialization that a division occurred between those artists connected with business and those who were connected to new organizations such as the Royal Canadian Academy and the National Gallery of Canada. As had occurred in Britain decades earlier, the former came to be seen as commercial artists, while only the latter were understood as "true" artists. This distinction had not existed in the 1870s when the Ontario Society of Artists was founded as part of an attempts by largely Toronto based artists to found art institutions which emulated those which existed in Europe. The society and its membership would eventually contribute to the establishment of the Royal Canadian Academy, the National Gallery of Canada, and the Ontario College of Art and Design. However, in the 1870s there was no perceptible shame in or distinction perceived between artists working independently or for commercial enterprises. There was also no perceived social difference between those who were involved in the mechanical process of photography and those who painted or illustrated. Both professions were understood as being acceptable elements of Canadian art. Davis claims that the foundations of Canadian art can be understood as beginning with the Montreal and Toronto photography studios of William Notman. The studios included galleries where not only photographs, but paintings by Notman's artists would be displayed. The studios, beginning in 1856, were amongst the first in North America to produce landscape and portrait photographs. In addition to producing high-quality photographs, the studios also hand coloured photographs, retouched photographs, created backdrops for portraits, and created realistic composite photographs. As many of the artists employed by Notman were also painters, they benefitted from having their paintings displayed in the Notman galleries along with the photographs the firm produced. Benefiting from his exposure were artists such as Henry Sandham, Charles Way, Otto Jacobi, John Arthur Fraser, and Robert Duncanson, all of whom worked for Notman Studios. Indeed, Notman's John Fraser was central to the formation of the Society of Canadian Artists in Montreal, and many of the Toronto Notman studio artists were founding members of the Ontario Society of Artists in 1872. But even this society, founded by members of a photographic studio, and which made use of the studio's premises for its exhibitions, began, in the 1870s, to reflect a division between the "mechanical" and the "handmade," with the latter being considered art and the former increasingly seen as the work of a technician. In 1873 the society banned works which were based upon photographs from its exhibitions, a decision which had also been made by the Art Association of Montreal in 1870. Davis notes that these decisions were made at a time when such paintings were actually very popular. Many who had their portraits painted desired paintings which looked almost as realistic as photographs. Indeed, at least in portraiture, the technique of painting from photographs persisted into the twentieth century. However, as Davis also notes, with the growing influence of institutions of high art, mechanical means of reproducing images was increasingly viewed as almost a technical trade rather than an art, as was the manual production of images from photographs. As the distinction between fine art and commerce became more pronounced, it influenced the social status of the different kinds of graphic artists, how they earned their living, and what institutions they were invited to join. In the case of the Royal Academy of Arts, established in 1880, allowance was initially made for engravers, designers, and architects amongst its forty full members. However, Davis notes that the representation of both engravers and designers fell after the first few years of the academy's establishment. Given that the works of the members were used to populate the National Gallery of Canada, which was also established in 1880, the underrepresentation of members who identified themselves as commercial-oriented graphic artists only further accentuated the division between such artists and those painters and sculptors who came to be seen as true artists. Yet, as Davis also notes, many of the other members of the academy were connected to advertising and engraving firms, providing them with illustrations to be reproduced. However, unlike engravers and designers, those artists did not identify themselves as being primarily involved in commercial art. Davis explains that this relationship between art and business was widespread, with many members of organizations such as the Ontario Society of Artists and the Royal Canadian Academy both exhibiting works at their exhibitions while also working for advertising agencies and commercial art studios. Artists such as J.W. Beatty, friend of the Group of Seven and First World War artist, had done work for an engraving firm, as a cartoonist for the Canadian Magazine, and taught at the Ontario College of Art. Similarly, Fred Challener had worked for the lithography company Stone Limited and taught art, as did C.W Jefferys, who also worked as an illustrator for several newspapers. Yet, regardless of these connections between the commercial and artistic worlds, by the 1880s and 1890s commercial work was increasingly being understood in Canada as a stage through which one might need to pass en route to becoming a "real" artist. As Davis notes, several members of the Group of Seven, who for many years have been understood by many art critics as the first expression of a unique Canadian style, began their careers in commercial art, although they too viewed their commercial beginnings as merely a necessary, although very useful, stepping stone to their fine art careers. A member of the Toronto Art Students' League, the oldest original member of the Group of Seven, J.E.H. MacDonald was employed as an engraver for the Toronto Lithographing Company and then between 1895 and 1922 as the head designer for Grip Limited. MacDonald also produced designs for books and magazines, for the calendars of the Toronto Art Students' League, and for posters that were used for the plays and exhibitions of the Arts and Letters Club of Toronto. As is noted by Stacey in The Canadian Poster Book, MacDonald claimed that his commercial training had offered him experience and the development of skills which were necessary in the execution of his later work. The same was true for the rest of the original members of the Group of Seven, with the sole exception of Lawren Harris. However, with the except for Tom Thomson, who was never formally a member of the Group of Seven, all of the group's members did eventually abandon their commercial work at agencies in order to pursue their fine-art on a full-time basis, although they continue to both teach and produce illustrations for publications. Yet, as Davis also explains, in Toronto during the first decades of the twentieth century the social distinction between successful commercial and fine artists was not always clear. The Graphic Arts Club, which succeeded the Toronto Art Students' League, as well as the Arts and Letters Club included both established fine artists and commercial artists. A similar division between fine and commercial art was occurring in the United States during the first years of the twentieth century, with many successful commercial artists resenting the often implied notion of commercial art being inferior to fine art. However, Davis also notes that, like in Canada, the distinction in the United States was also gradual. She quotes the American Howard Pyle who, working as editor of McLure's magazine in 1905, did not believe there to be a distinction between good illustration and fine art. Likewise, Davis notes Norman Rockwell's assertion that, when he attended the New York Art Students' League from 1910 to 1912, no distinction in status was made between classes in illustration or those in portraiture or landscape painting. Davis likens this development of a distinction between commercial and fine art to how Bewick and other early wood engravers were referred to as independent artist-craftsmen, but that those who would later work in wood engraving shops for newspapers and magazines were referred to as "mechanical" engravers, mechanically engraving a particular piece of boxwood without ever seeing the final result. By the beginning of the First World War the graphic arts companies that were providing visual materials for the publishing and advertising industries had expanded to all of the major Canadian cities. The Toronto Engraving Company, which had changed its name to Brigden's Limited in 1911, established a Winnipeg branch office in 1914. The Toronto Lithographic Company merged with Rolph, Clark, Stone Limited in 1917 and John Bengough's engraving company had become Grip Limited in 1901. Others, such as Copp, Clark, and Company continued to expand. These companies employed skilled and often unionized photoengravers, printers, and other workers. As Davis notes, because of their specialized skills and unionized job protection, these workers retained a certain level of status. The arts employed by these companies, however, were not viewed as being of the same caliber as fine artists. In addition, Davis notes that they could not even be considered as being the "art-workmen" discussed by John Ruskin, in that they were separated from the actual tasks of reproducing their art, such as photography, photo-engraving, or printing. Rather, they were labelled "commercial artists." Yet, Davis argues that these artists were instrumental in creating a "popular," as opposed to a "high" Canadian art. Furthermore, since many later went on to fine art careers, she claims that the commercial arts industry can be understood to be a bridge between commercial and fine art. Focusing her study of the development of the graphic arts industry in western Canada on Winnipeg, the largest city in western Canada at the beginning of the twentieth century, Davis explains that prior to and following Confederation, most graphic artists who went west of Upper Canada only did so as either recorders or reporters with survey crews or exploration teams. Very few stayed in the largely unsettled west. Indeed, it was only with the rise in the acceptance and popularity of illustrated newspapers and magazines that artists and engravers came to settle in the cities of the west, and like in the east, the industrial processes which made large circulation illustrated publications possible also saw them experience the same specialization and loss of artisanal skill which had occurred in the east. Furthermore, as in the east, the graphic arts industry provided employment for many of the local photographers and photo-engravers, as well as aspiring young artists, who otherwise may not have had a steady source of employment. By the First World War Winnipeg had all of the elements required for sustaining a graphic arts industry, including a relatively large and growing population, financial institutions, manufacturing, and a printing industry. All of this industry sustained and supplied not only the city, but also much of the expanding west. Since the fur trade the settlement had been the supply hub for the region, also becoming the regional transportation hub with the coming of the Canadian Pacific Railway in the 1880s. Furthermore, the city was expanding rapidly. Although the population was only 241 in 1871, it had climbed to 136,035 by the census of 1911. Printers had existed in the Winnipeg area since as far back as 1859 when the Reverend Griffith Owen Corbett published the Headingly Press, a political broadsheet. The same year two printers/journalists, William Buckingham and William Coldwell, started the newspaper, the Nor'Wester. Having worked for the Globe and the Leader in Toronto, their newspaper was named after the North West Company, which had been the unchartered Montreal-based competition/rival fur trading company to the Hudson's Bay Company before the latter absorbed the former in 1821. In keeping with its namesake, the Nor'Wester was largely used by its editors and publishers as a means of voicing dissatisfaction with the Hudson's Bay Company's control over Rupert's Land, including the Red River Colony. By the mid-1860s control over the paper had been purchased by John Christian Schultz, a businessman and speculator from Upper Canada who advocated western expansion and English-oriented settlement, and the end of fur trade-based rule by the Hudson's Bay Company, which he and his supporters viewed as an impediment to settlement. Not supported by much of the population, including the Métis, Schultz sold the paper and the press in 1868, although it was confiscated and the Nor'Wester outlawed by Louis Riel and his provisional government in 1869. The same fate befell another paper started by William Coldwell in 1869, the Red River Pioneer. As Davis notes, other papers were started after the establishment of the Province of Manitoba. Indeed, between 1859 and 1884 ten dailies and twenty-two weeklies or semiweeklies were started. However, by 1885 there was only one daily, the Manitoba Free Press (later the Winnipeg Free Press), and for weeklies. One of the major factors in the development of the graphic arts industry in Winnipeg at the beginning of the twentieth century was the establishment in 1905 of a branch of Eaton's department store. Built to be the an enormous factor in the retail and catalogue shopping trade in the expanding west, the new store had five and a half acres of floor space and employed 800 people. While disastrous for its retail competition, the arrival of Eaton's and its western Canadian mail order catalogue, which was to be designed and executed in Winnipeg, featuring goods which were suited to the needs of western Canadian farm families, as well as those in the growing towns, was very beneficial for the Winnipeg graphic design trade. To benefit from this situation, Brigden's, the commercial art firm which did much of the work for Eaton's in Toronto and the eastern Canadian mail order catalogue, opened a Winnipeg office in 1914. There already did exist a number of commercial art firms in Winnipeg before the arrival of Bridgen's. These included Stovel's, Bulman's, Buckbee Mears, Campbells, Commercial Engravers, the Ransom Engraving Company, and the Reed-Thompson Engraving Company. However, so as to take advantage of some of the established business, Brigden's bought Reed-Thompson in 1913 and then took over much of the building housing the magazine, the Farmer's Advocate. It became one of the largest and most influential firms in the city, continuing the lucrative Eaton's catalogue work done by its eastern parent firm. Brigden's, like the other commercial art firms in Winnipeg, relied upon artists to create many of the images which it supplied to clients. Davis claims that, while being home to numerous artists, Winnipeg's artistic community has often been ignored by Canadian art historians, possibly because many of the city's artists had close connections with the field of commercial art. This is the same argument she offered for many art historians ignoring much popular Canadian art prior to the establishment of the Group of Seven. Those in Winnipeg worked as art teachers, newspaper cartoonists, engravers, and graphic art illustrators. These artists included Victor Long (Buckbee Mears), Frank Armington, Hay Stead (cartoonist for the Manitoba Free Press), E.J. Ransom (founder of the Ransom Engraving Company), Lionel LeMoine FitzGerald (member of the Group of Seven), William winter, Charles Comfort, Walter J. Phillips, and Eric Bergman. Furthermore, Armington, Stead, and Ransom helped form the Manitoba Society of Artists in 1903, exhibiting in private homes and at public fairs. The Winnipeg Art Gallery was established in 1912, and the next year the Winnipeg School of Art was opened as a school of art and design, offering training in both fine and commercial art. Indeed, Davis notes that, despite the recognition which came from attendance at the art school or having works displayed in the gallery may have offered local artists, in the years before the Second World War, Winnipeg's commercial art firms were essential to allowing many local artists the ability to earn a living, as well as apply and develop their artistic skills. Other graphic art firms of note in Western Canada during the pre-Second World War era discussed by Davis include the Hammond Lithographing Company in Calgary, as well as King Show Print, one of Canada's most successful printers of circus and show posters. Started by the printer and publisher of the Rouleau Enterprise of Rouleau, Saskatchewan, Andrew King, in 1912, King Show Print continued producing posters until 1958. Davis begins by noting that the First World War provided the Canadian graphic arts industry with various contracts for Victory Bonds and other government war-related material. Once again concentrating upon the Toronto-based firms, Davis claims that, as the largest graphic arts centre in the country, Toronto and its firms can serve as an example for the rest of the country at the time. Furthermore, after 1918 improvements occurred in technology to ensure that the industry was more efficient, and thus, not significantly harmed by the fall in government contracts. However, while beneficial for the owners of he firms, the improvements in efficiency were not always good for the workers. Working conditions, pay, hours, and the introduction of technology such as offset printing and new photography processing created tension between workers and their employers. Whereas the printers, lithographers, typesetters, and other workers at graphic arts firms were unionized, Davis notes that the same was not true of the artists at those firms. They did not undergo unionized labour disruptions, but continued to be trained as apprentices or attended art school. Following their artistic education they would either be hired to work on regular publications or to illustrate catalogues, publications, and advertisements. However, Davis also claims that during the 1930s a reaction began to grow within the Canadian artistic community to the dominance of the nationalism and landscape paintings of the Group of Seven. While, starting in the 1920s, the group was seen both nationally and internationally as representing Canadian art, other Canadian artists began to resent this situation, especially since the dominance of the Group of Seven caused the national and international public to ignore other examples of Canadian art as being real art. Reacting to the nationalism and landscape-focused works of the Group of Seven, other artists began to focus upon international issues and painted in the style of other international movements. Indeed, during the 1930s Canadian artists debated over the notion of art being created either for arts sake or for a purpose. Many of those reacting to the Group of Seven supported the views of Ruskin and Morris that art should not be separated and removed from the public. Rather, they claimed that movements such as abstraction and modernism only helped to create art which could be appreciated by only a few, a position which was all the more popular during a period when elites were often seen as being out of touch with the realities of society. Davis dedicates her last chapter to offering a brief overview of the positions she advanced throughout the book. She begins by explaining that one can date the beginning of Canada's graphic arts industry to the 1870s and the establishment of a small number of artisanal engraving and lithographing firms in Eastern Canada in the 1870s. These firms had been preceded by individual engravers and printers who had either come to and left Canada, or had needed to find other means of employment when they discovered that they were unable to support themselves through printing, engraving, or lithography alone in British North America. However, by the 1870s, with the growth of Canadian cities, a popular press, growing literacy rates, better transportation systems, and the increased mechanization and industrialization of the printing process, retailers and publishers began to recognize the value of illustration and designed layouts in the selling of goods, newspapers, books, and magazines. However, while the engraving, printing, and lithographing firms grew, they also lost their status as small enterprises run by individual artist-craftsmen, or art-workers. These original founders of the firms had begun working on their own, or with one or two other artist-craftsmen, and had been intimately involved and knowledgeable of the entire process of engraving, lithography, and/or printing. As their firms grew with increased demand for their services, the creation process began to be divided amongst different workers, each of whom came to hold an increasingly limited range of skills and/or were regularly involved in only a portion of the creative process. This was not unlike other industries where demand for products resulted in the division of labour and an increase in production. While, initially, many of the people employed by the expanding firms were often just as skilled as their employers, and thus, could perform a wide variety of tasks, by the 1890s and the introduction of photography, photo-engraving, and eventually colour printing services, those charged with specific tasks occupied specific work spaces and were needed to concentrate on those specific tasks. Even with the division of labour, the graphic arts industry always required the skill of artists. Although the engraving, lithographing, printing, typesetting, and photoengraving processes did involve elements of repetitive physical labour which could be assigned to workers who were only trained/skilled in those narrow tasks, the illustrators and engravers who could visualize ideas and transform them into graphic representations which could then be mechanically reproduced were always needed. Even when wood engraving was replaced by the mechanical process of photoengraving, illustrators, photographers, and layout artists were still required to create and arrange the images which were to be reproduced. The original founders of engraving, lithographing, or printing firms were intimately involved in all aspects of their enterprises. They produced, accepted, or commissioned the graphic material to be reproduced, acquired their own tools, kept their own premises, advertised their skills, and reproduced images and text themselves. Yet, as the value of their work began to be recognized by newspaper publishers such as George Brown of the Globe and retailers such as Timothy Eaton, they began to expand, acquiring larger staffs, more machinery, and specifically designed premises. As circumstances demanded or allowed, different firms also merged so as to both grow and expand their graphic arts services. However, not all graphic artists, many of whom originally had many of the same skills, came to own or run their own firms. Rather, while some were owners, most were only ever employees. Davis argues that this was simply because there were only a small number of skilled artist-craftsmen who had the resources to start their own firms. Others, although just as skilled, simply lacked the financial resources necessary to found their own firms. As firms grew, labour was divided, and processes were increasingly mechanized, there came to be a separation between art and craft. The artist and the engravers, the photo-engravers and the printers, all became separated, as did commercial art from fine art, the latter of which had no "purpose" and the former was increasingly viewed as art on demand which could not challenge ideas or simply exist for its own sake. Those who were the first "technically skilled" employees in the graphic arts included photoengravers and printers. While technically more complicated than wood engraving, the new process of photoengraving, involved less artistic skill and so was able to be easily broken up into a number of technical steps that were carried out by individual workers. Davis begins her book by explaining that Canadian art and certain elements of Canadian popular culture were not simply the descendants of the European fine art tradition as it was transported to Canada. Hello Blogger, I must say you are performing very well right here, I conclude that your are going to be super famous as due to your unique content right here. I found a similar website as yours about Canadian Patriotic Clothing. Check out this, Best of luck!